December 17 1908 -- Secretary of Commerce and Labor Oscar Straus has made public remarks to the effect that the Chinese should be allowed to immigrate to the United States, in essence thumbing his nose at the Chinese Exclusion Act, which severely restricts such immigration. 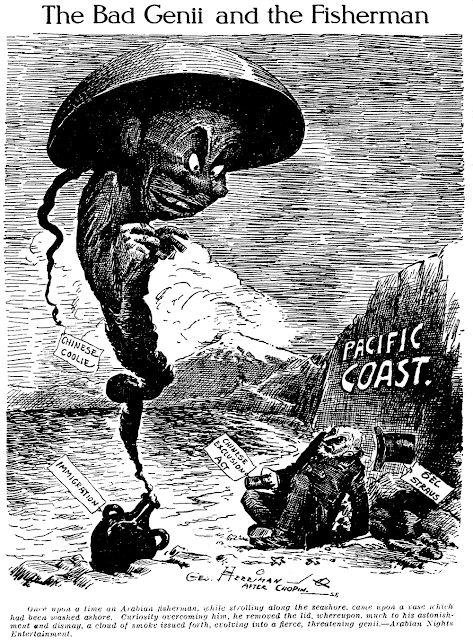 In what has to be Herriman's most racist cartoon at the Examiner, he not only comes out on the very, very wrong side of this issue, but applies a racist stereotype to the Chinese, draws the Jewish Straus with a big hawk nose, and even sideswipes him for his important work with the Arab nations when he was the ambassador to Turkey. Not a great day for Herriman, the Examiner, or the people of California. This postcard is from T.P. & Company, whose logo is a stag in a crest. It says it is Series 803, and seems to date to around 1911 or so. T.P. 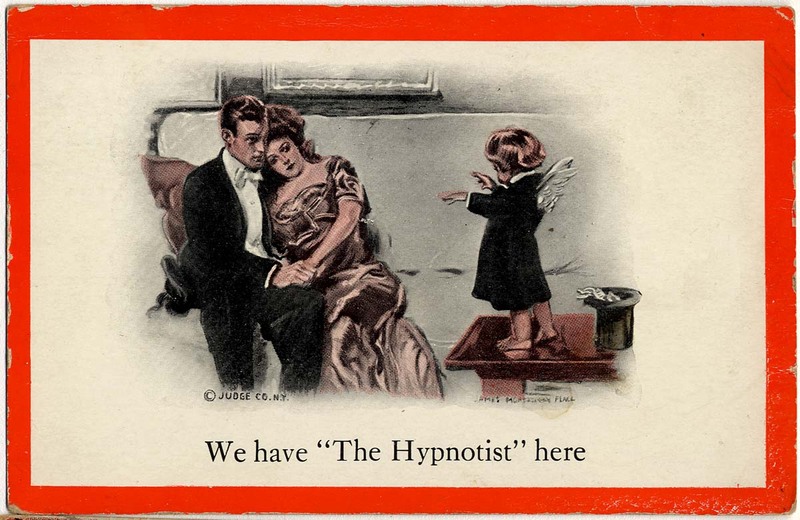 & Co. also produced this card in a cheapo version with no color, as Series 738, with the caption changed to just "The Hypnotist." I don't know if T.P. & Co. licensed a bunch of images from the humor magazine Judge, or if this is a one-off. Postcard experts, are you out there? Well, what I do know is that this is an example of James Montgomery Flagg doing his best to imitate Charles Dana Gibson. That was one of his early specialties, and he was pretty darn good at it. Charles Dana Gibson couldn't resist tossing out a gooey scene of young rich lovers getting a visit from Dan Cupid somewhere, usually the centerpage of the famed cartoon & humor magazine, LIFE. Their major competitor was Judge, who had Flagg on their side as the antimatter version of CDG. JUDGE was involved in lots of licensing of their cartoons, I've seen them as art prints, calendars and playing cards, and this post card could have originally been a cover or centerpage of a Judge issue. Like many of the leading Ashcan School artists, Walt Kuhn made more of a living as a cartoonist than as a painter early in his career. 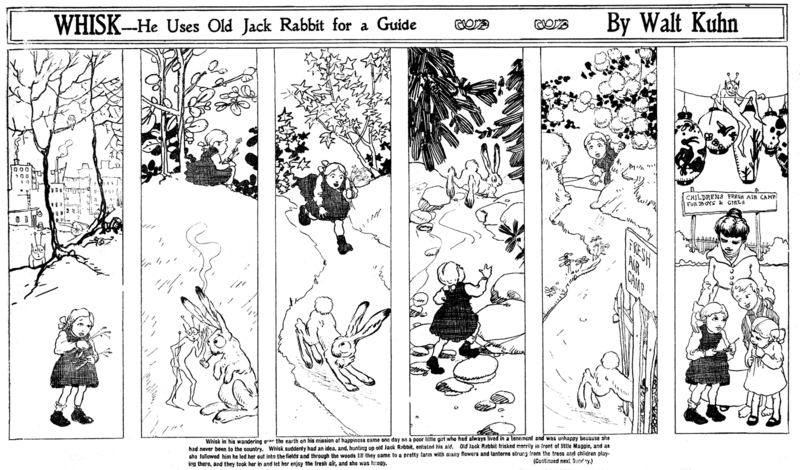 He did so mostly in the humor magazines, but he also did create a Sunday series for Pulitzer's New York World in 1909. The series was titled Whisk, an odd choice of name for the star of his show, a little elf. The series began on Valentine's Day, February 14, with an epic storyline (well, epic for 1909) in which Whisk is commanded by the Elf King to go forth and find a poor lost sunbeam. The key to finding the sunbeam, he is told, is that it will be shining on someone who is totally and completely happy. A series of adventures ensues in which Whisk seems certain to have found someone who is just that over-the-top happy, but it always turns out that there is a little trouble in paradise. Kuhn writes the episodes as if he's telling one long continuous story, ending each episode with a cut in mid-sentence (see top two samples). Dickensian cliff-hangers they ain't, and the conceit comes off more as bad writing than anything else. Finally in the May 16 episode Whisk does locate the lost sunbeam, shining down on a mother and her baby (all together now --- awwwww). The sunbeam is presented to the Elf King, who is so impressed with the job Whisk did that he presents him with a magic wand charged up with thousands of magic sunbeams. Whisk's new task is to go forth once again, find unhappiness and correct it with a barrage of sunbeam bullets. The tone is thus set for the rest of the series, wherein Whisk finds unhappy creatures and gives them a jolt of joy-juice. Unfortunately, the series which was thus far written in straight if rather flowery prose, eventually changes to (shudder) really bad rhyme. As you may know, my tolerance for bad poetry is exhausted half-way through a haiku, and finally I think I have found fellow doggerel-haters in the editorial offices of the New York World. Whisk had usually been featured in full 4-color glory on an outer page of the World's Sunday sections, but once this darn poetry reared it's ugly self, the strip was almost invariably consigned to the 1- or 2-color interior ghetto. Maybe it was coincidence, but I like to think otherwise. You'll find quite a few references saying that Whisk ran until October 1910, but that's not the case. I believe that error traces back to a typo in Ken Barker's New York World index in Stripscene magazine. 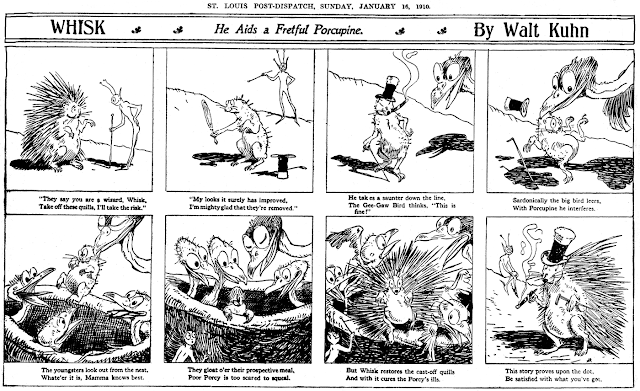 Actually, the series ended on February 27 1910, which would seem to indicate that Kuhn was given a contract for one year's worth of strips, and the World passed on any more after that. Edward Scott “Ted” Brown was born in Stillwater, Minnesota, on September 14, 1876. Brown’s full name and birth date were on his World War I draft card. The birthplace was recorded his his Social Security application. The 1880 U.S. Federal Census said Brown was the youngest of three children born to lumberman George and Ida. They resided in Stillwater on Second Street. The Literary Digest, October 14, 1933, profiled Brown and told how he got into art. Edward S. (Ted) Brown — Born September 14, 1876, at Stillwater, Minnesota. High-school education — Minneapolis. Went to Klondike rush in ’98. Spent three winters and four summers knocking around mining camps of Alaska. Worked in mines, drove dog teams. Carried chain on the preliminary survey of the White Pass and Yukon Railroad. Also cooked for stripping crew of same outfit. Commercial drawing in St. Louis advertising agency; same thing, Minneapolis Advertising Service Co.; ditto, Chicago. Comic strips on Chicago Daily News. Editorial cartoons on Chicago Daily News. Editorial cartoons on New York Herald Tribune. Brown was counted twice in the 1900 census. He was a member of the family in Minneapolis, Minnesota, at 3207 4th Avenue. Brown actually lived in Porcupine, Alaska, with seven other people. He worked in mining. 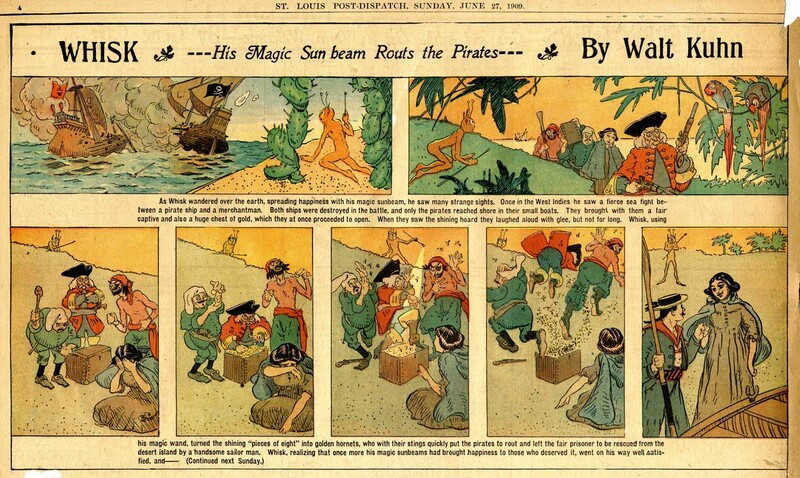 American Newspaper Comics (2012) said Brown created over two dozen strips, including The Inventor, from 1904 to 1914, for the Chicago Daily News. Brown also contributed to four series by other cartoonists. According to the 1910 census, newspaper artist Brown as a resident of Proviso, Illinois. He and his wife lived at 718 4th Avenue. The Indiana Marriage Index, at Ancestry.com, said Brown married Amelia Otis on October 12, 1905 in Lake County. The couple had two sons, three-year-old son, Edward Jr. and eleven-month-old Phil. 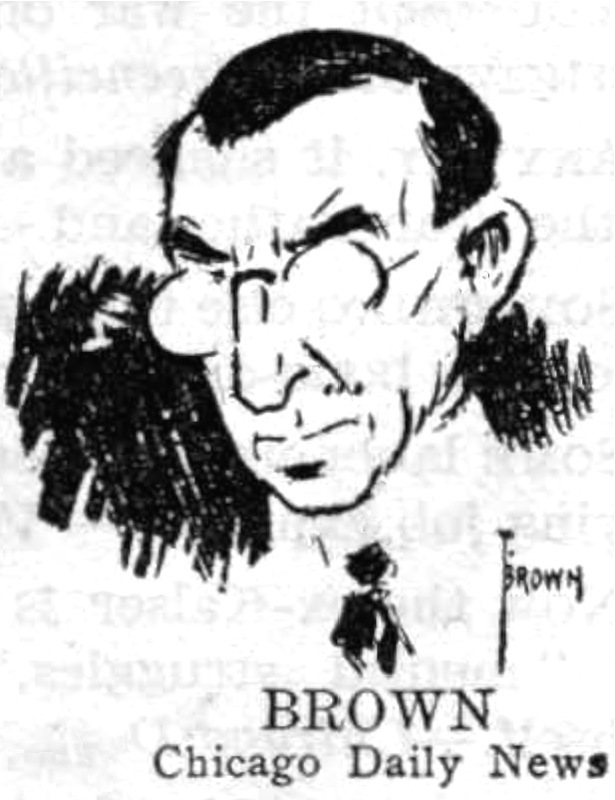 Moving Picture World, December 1, 1917, said Universal Current Events, filmed 39 cartoonists, including Brown. 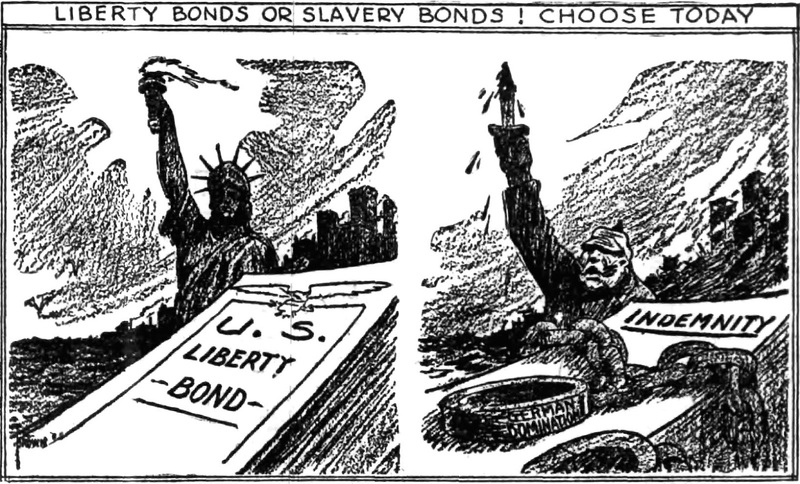 During World War I, the Editor & Publisher, May 4, 1918, reported Brown’s award-winning cartoon (above). Brown signed his draft card September 12, 1918. His address was 59 West Stone Avenue, La Grange, Illinois. 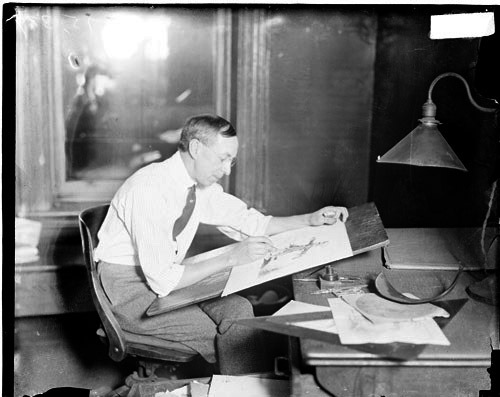 The Daily News cartoonist was described as medium height and build with brown eyes and dark hair. Brown’s address was unchanged in the 1920 census. The family included a third son, Gordon. In 1925, Brown joined the staff of the New York Herald-Tribune. A 1927 Norwalk, Connecticut, City Directory listed Brown at 35 East Avenue which was the address in the 1930 census. The census said Brown’s household included his mother-in-law, Julie Otis, and adopted daughter Claire who was a year-and-a-half. Brown has not been found in the 1940 census. His home address did not change according to a 1941 city directory. Brown passed away December 28, 1942, in Norwalk. Many newspapers, including the Boston Traveler (Massachusetts), December 28, 1942, published the Associated Press report. Norwalk, Ct., Dec. 28 (AP) — Edward Scott “Ted” Brown, 66, of this city, cartoonist for the New York Herald-Tribune since 1925, died today at Norwalk Hospital after a brief illness. He came to the Herald-Tribune in 1925, after 17 years with the Chicago Daily News. Born in Stillwater, Minn., Brown went to Alaska in the gold rush when he was a young man and was a member of the Arctic Brotherhood of Alaska and the Adventurers Club of Chicago. Mr. Brown leaves his widow, Mrs. Amelia O. Brown, three sons, Edward S., Jr., Philip R. and Gordon G. Brown, and a daughter, Miss Claire Ellen Brown, all of Norwalk. The Berkshire Eagle (Pittsfield, Massachusetts), December 29, 1942, printed this article. Norwalk, Conn. — Edward Scott (Ted) Brown, an editorial cartoonist for the New York Herald Tribune for 17 years, died yesterday in the Norwalk Hospital after a brief illness. He was 66 years old. Mr. Brown joined the staff of Tribune in 1925, after 21 [sic] years with the Chicago Daily News. 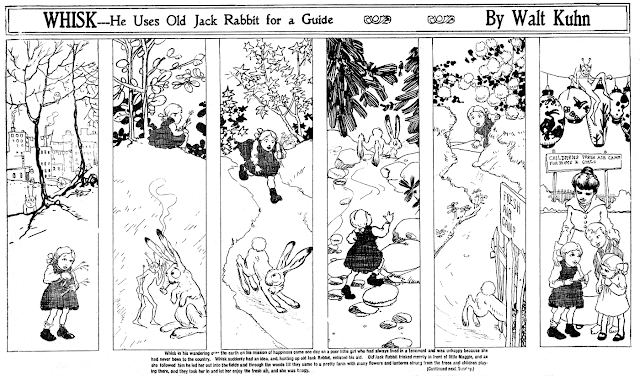 His cartoons, supplementing those of Jay N. (Ding) Darling in the Herald Tribune and papers subscribing to the New York Tribune Syndicate, appeared at frequent intervals until last June, when poor health reduced his work. 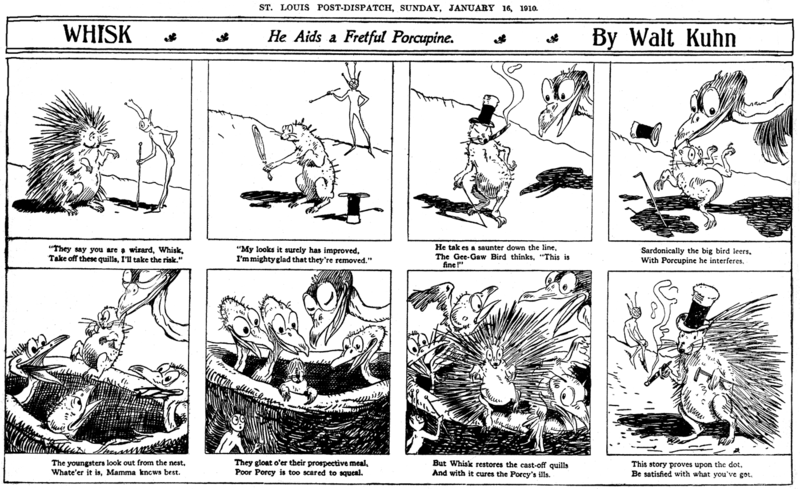 I've written about the pioneering daily comics page of the Chicago Daily News several times here on the blog, so I'll just quickly remind you that they were syndicating an almost full page of comics, panel cartoons and text gags well over a decade before Hearst and Pulitzer got on board. The Daily News comics page lost much of its vigor in the 1910s. Two factors were to blame. First, obviously their product was no longer unique and had to compete in quality with very good daily comics from the big syndicates. Secondly, the News' strips were now syndicated through the Associated Newspapers co-op, rather than the News' own syndication efforts, and the profit motive had been substantially muted. No longer was there constant experimentation on the back page of the News, instead there was now a short list of much longer-running strips that inevitably outlived their potential for humor. The cartoonists in the News bullpen were bred for experimentation, and now were yoked to the same old plough every day, and it didn't suit them. One of the great cartoonists at the Daily News was Ted Brown, who started signing his first name only to back page series in 1905. 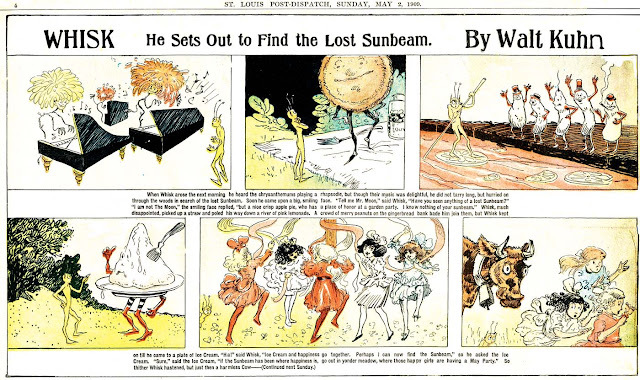 He was incredibly prolific, as were many in the News bullpen, and he stuck around until the page had been pretty thoroughly usurped by syndicated material from elsewhere in the mid-1910s. His last new series for the Daily News was The Inventor, which started on July 22 1914. It was not a true daily, but came closer to that standard than anything he'd done before. It was a very repetitive strip (as was true of many Daily News series). but Brown has to be given kudos for coming up with an endless series of new inventions that backfire in one way or another. At the rate of one strip every few days, I can see readers finding it quite entertaining. Tracking The Inventor becomes difficult because, in a move that would become increasingly common in the newspaper world later on, the Chicago Daily News quit running the strip but continued having it produced. Associated Newspapers offered so much material that the Daily News ended up running outside series more than its own. 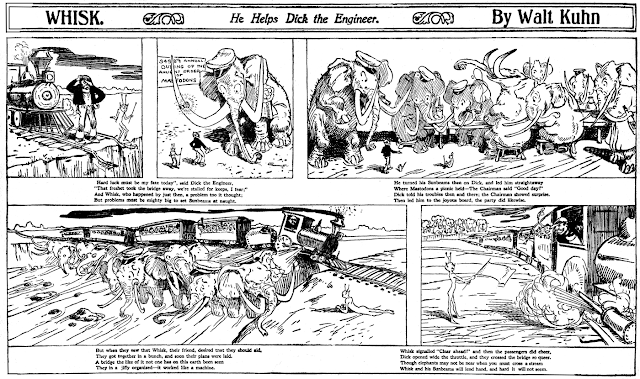 In the Boston Globe, which liked The Inventor well enough to feature it regularly, the strip became a true daily starting September 1915. They too tired of the strip, though, and I have to track it to 1917 through the less reliable source of the Columbus Monitor, which began running it that year. By then, though, Ted Brown was gone, and it was being produced by Austin C. Williams. 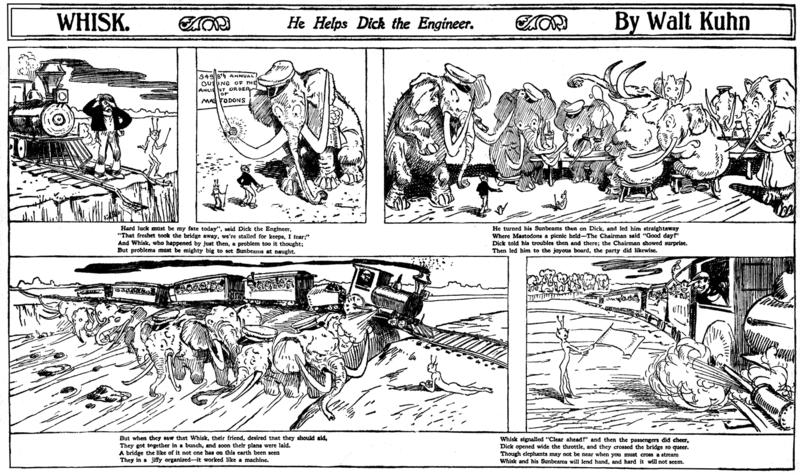 The series came to an end in the Monitor on June 30 1917. Universal Current Events Claims to Have Captured Thirty-nine Funny Men. 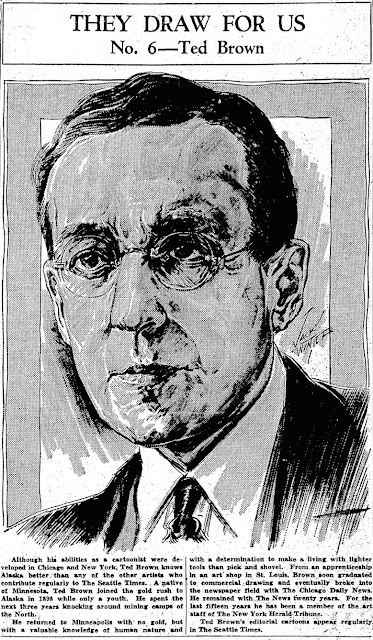 W. A. Rogers, New York Herald; W. C. Morris, New York Evening Mail; Robert Carter, Philadelphia Press; Charles Henry Sykes, Philadelphia Evening Ledger; R. K. Chamberlain, Philadelphia Evening Telegraph; F. T. Richards, Philadelphia North American; John L. DeMar, Philadelphia Record; Fred Morgan, Philadelphia Inquirer; Nelson Harding, Brooklyn, N. Y.. Eagle; Ted Brown, Chicago Daily News; “Cy” Hungerford, Pittsburgh Sun; Bert Link. Pittsburgh Press; Elmer Donnell, St. Louis Globe-Democrat; Claude Shafer, Cincinnati Post; W. A. Ireland, Columbus Evening Dispatch; Harry J. Westerman, Ohio State Journal; Harry Keys, Columbus Citizen; J. H. Donahey, Cleveland Plain Dealer; James Lavery, Cleveland Press; Fred O. Seibel, Albany Knickerbocker Press; Wm. A. McKenna, Albany Evening Journal; W. K. Patrick, New Orleans Times-Picayune; Lute Rease, Newark Evening News; Alfred W. Browerton [sic], Atlanta Journal; Lewis C. Gregg, Atlanta Constitution; “Cad” Brand, Milwaukee; Sentinel; Gaar Williams, Indianapolis News; Cornelius J. Kennedy (“Ken”), Buffalo Evening News; R. O. Evans, Baltimore American; G. R. Spencer, Omaha World-Herald; J. P. Alley, Memphis Commercial Appeal; Paul B. Fung, Seattle Post-Intelligencer; John F. Knott, Dallas News; James J. Lynch, Denver Rocky Mountain News; Paul A. Plaschke, Louisville Times; McKee Barclay, Baltimore Sun; Walter Blackman, Birmingham Age Herald; A. J. Taylor, Los Angeles Times; Roy Aymond, New Orleans Daily States.